Digital Atmosphere is a powerful weather forecasting program that allows you to create detailed maps of real-time weather for anywhere in the world. 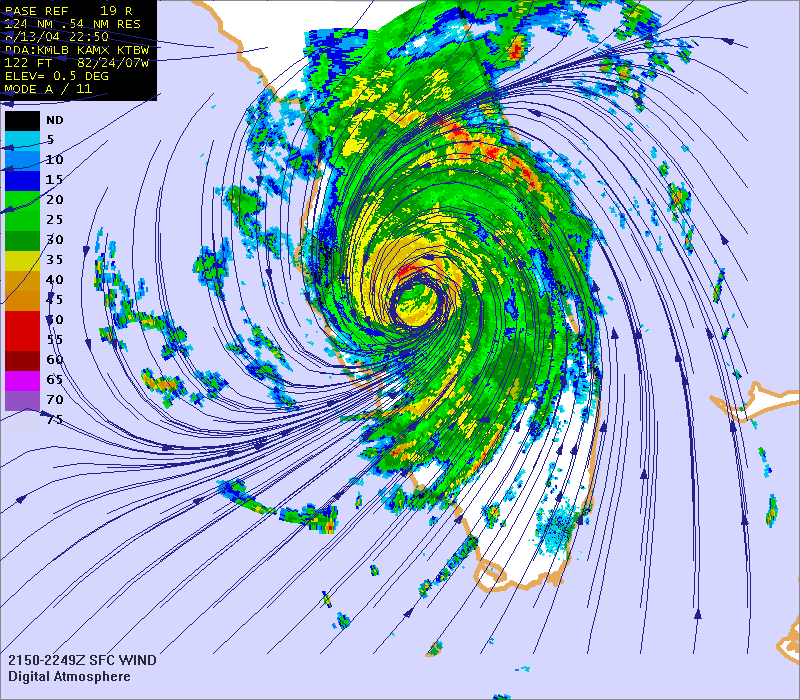 It makes extensive use of techniques and algorithms that are comparable and in some cases superior to the National Weather Service's multimillion-dollar systems. It runs on any Windows system, and uses free data from government and university sources on the Internet. Digital Atmosphere Historical Data is now included as of version 3.06! You can download a fully functional program and use it for 30 days to test out its capabilities. If you like it, register and we will send key numbers to keep the program functional past the 30-day evaluation period. Registrations are processed manually and you will receive an email with instructions on how to obtain your key within 3 days of your order. Digital Atmosphere imports and displays land synoptic (WMO FM 12 SYNOP), ship synoptic (WMO FM 13 SHIP), METAR (WMO FM 15 METAR), buoy (WMO FM 18 BUOY), upper air (WMO FM 35 TEMP), aircraft data report (ACARS) (WMO FM 42 AMDAR), NMC frontal depiction transmission format (ASUS1 KWBC), gridded binary (GRIB) (WMO FM 92-IX), NEXRAD Level III (ICD 2620001) WSR-88D NEXRAD format, Australian AXF comma-delimited observational data and similar formats, NHC Hurricane Warning bulletins, any weather agency's radar images available on the web (JPG or non-animated GIF; configuration may be required), and more! Click any screen shot to enlarge. 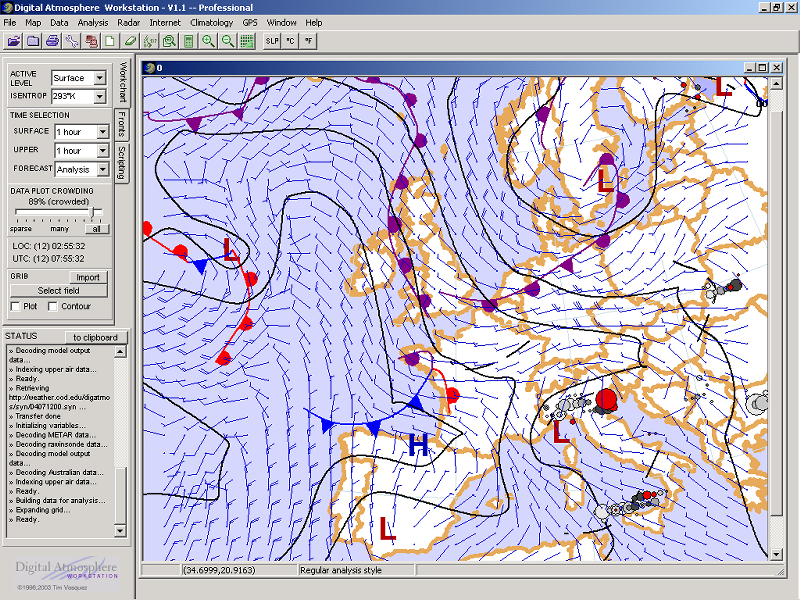 Basic surface data can be plotted worldwide from METAR, SYNOP, and BUOY data. 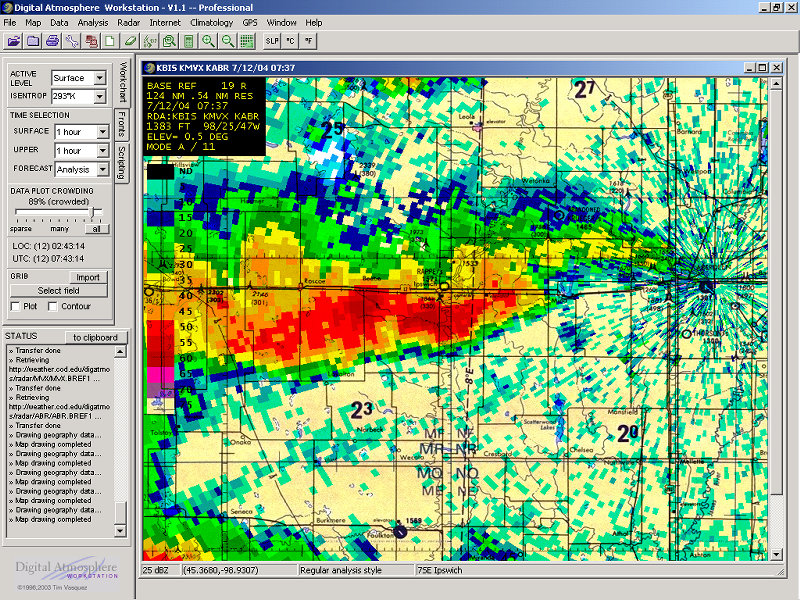 Composite of surface data, radar reflectivity, and gridded wind. The powerful radar import feature allows use of international radars, such as in Canada. 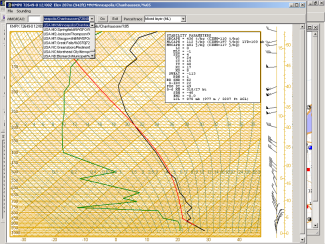 Digital Atmosphere not only imports Australian AXF data but also can use the legacy NMC/NCEP font. 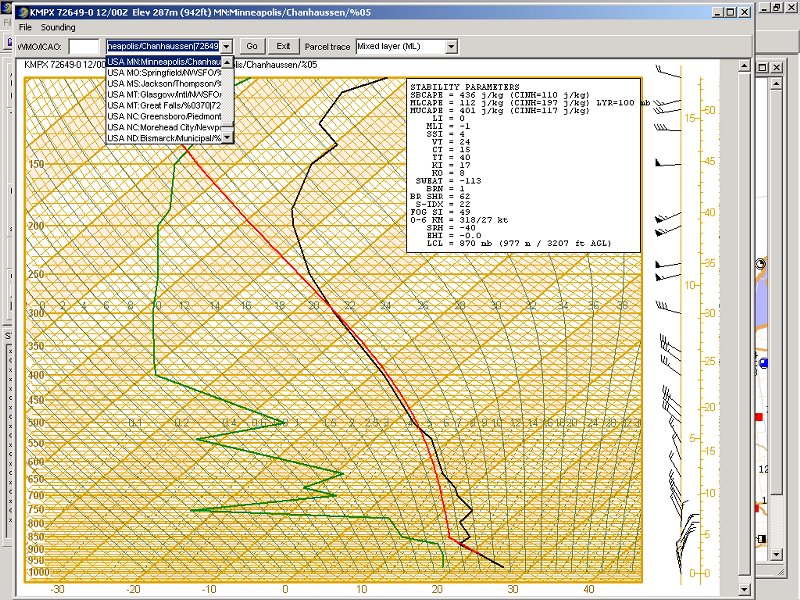 Digital Atmosphere's SKEW-T's are suitable for the most demanding storm forecasting work. 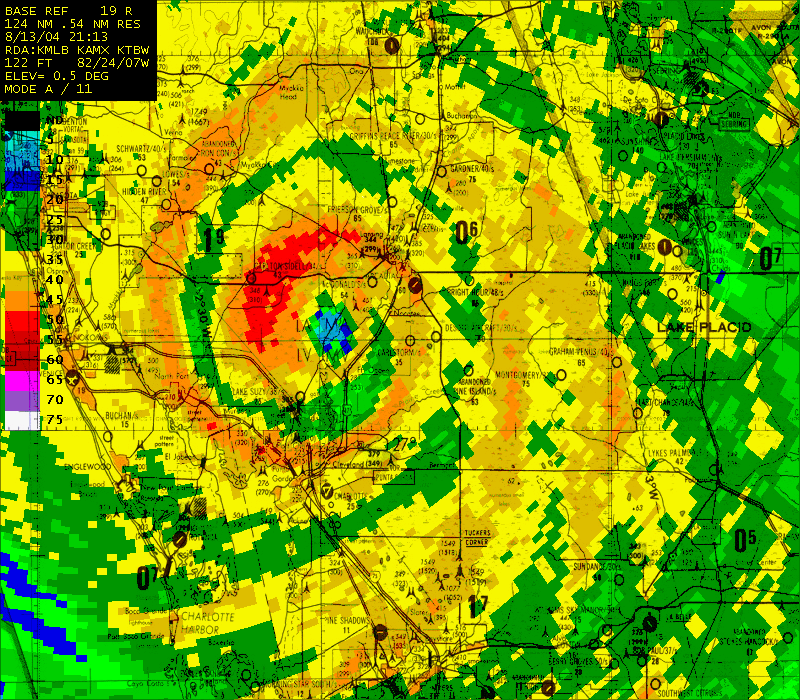 Radar data can be plotted against detailed U.S. maps in the Professional Version. Digital Atmosphere supports the European FLEETCODE bulletins. Standardized planetary maps can be imported from many different sources on the Internet. Plotting shapefiles is a breeze. 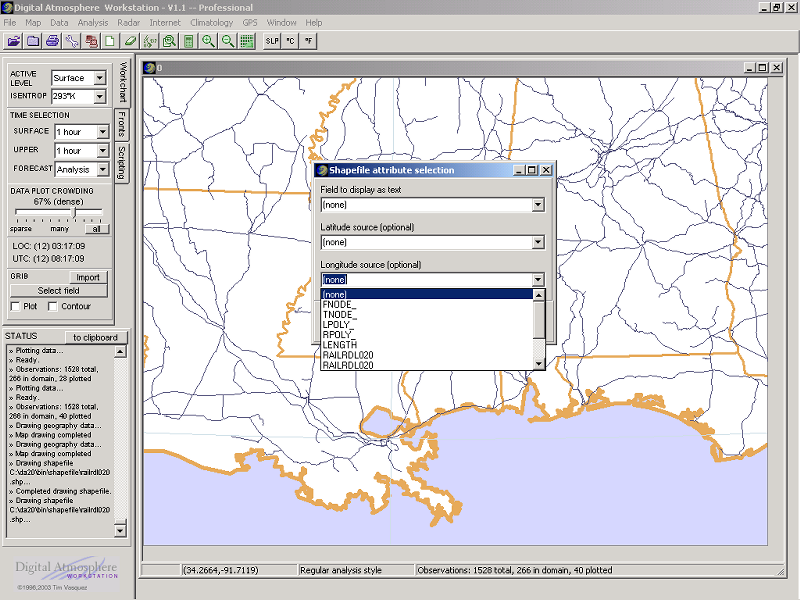 Here, a shapefile for U.S. railroads is imported. Digital Atmosphere allows color schemes to be changed readily. 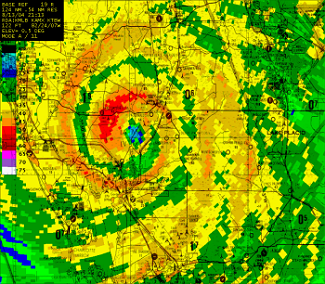 Hurricane Charley as plotted against street-level TPC raster maps (Professional Version) in west central Florida. You can see exactly which communities are getting struck by the eyewall. 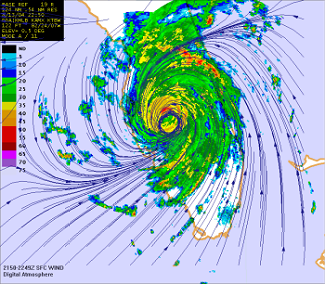 Hurricane Charley with streamlined METAR/BUOY wind fields. There is a slight position shift since the radar is minutes old while the surface data is about 20 minutes old. What is the current version and what's new? The current version is 3.06, released 24 June 2018. Adds anti-aliased isopleths, station tables updated to 6/24/2018, support for Digital Atmosphere Historical Data, debugging info added to About form, QC panel has been fixed, unlimited scripting character limit per row, shading analysis scripts added, other changes. What kind of raw data does Digital Atmosphere accept? It uses almost every conceivable format established by the World Meteorological Organization. 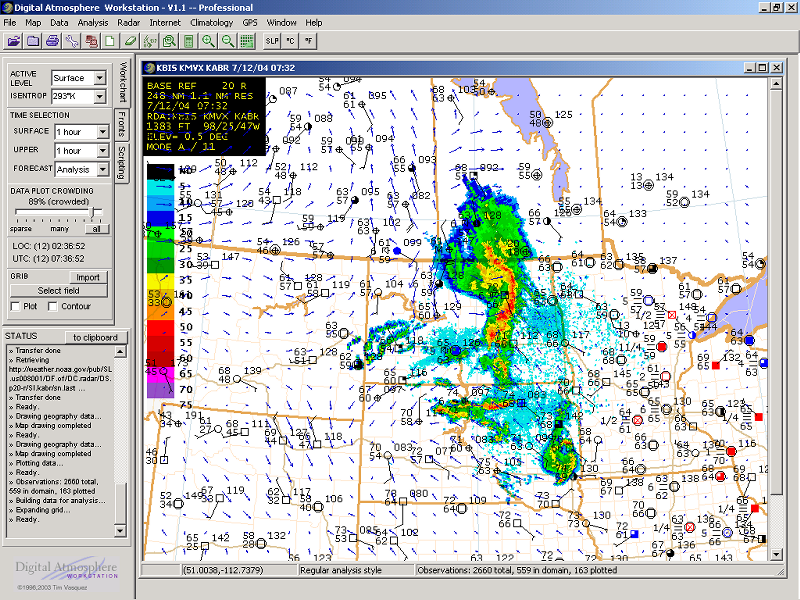 These include SYNOP, SAO, METAR, PILOT (TTAA/TTBB/PPBB), NIDS WSR-88D data, and more! All of this data is accessible for free (it's on the Internet and anyone can get it). It's taken care of for you! You just check off the kind of data you want on the Internet Retrieval panel and Digital Atmosphere will fetch it for you and import it for instant viewing. You can change or add new URLs at your discretion. 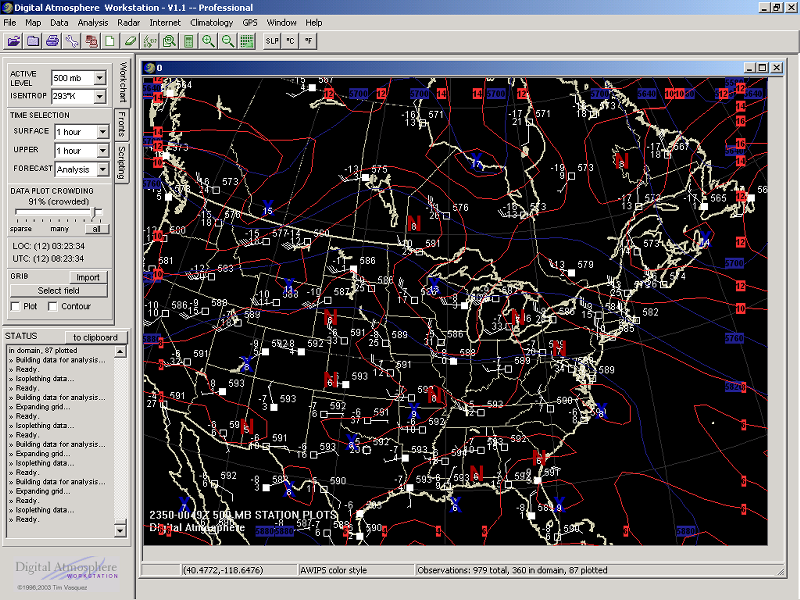 You can also use great weather databases such as WSI and AccuData, and any canned (saved) data. What is Digital Atmosphere Historical Data? 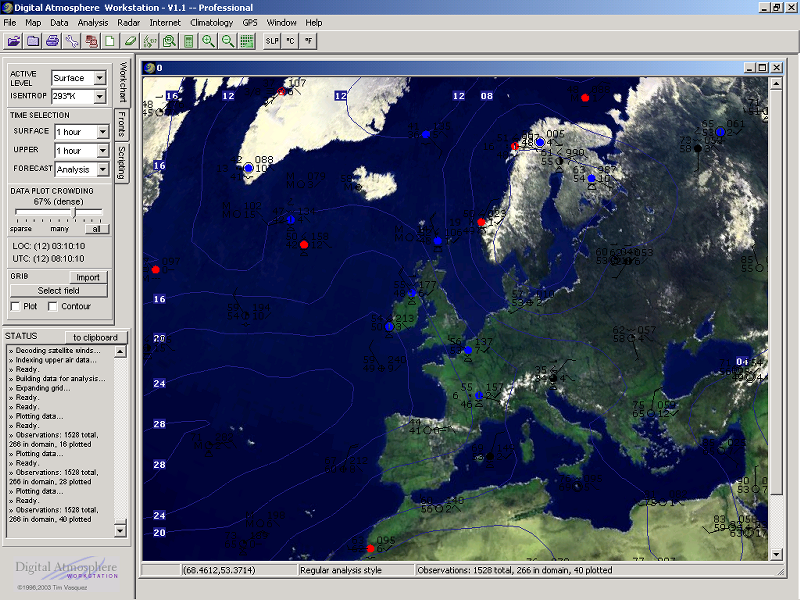 View weather situations going back 87 years with Digital Atmosphere Historical Data! These are complete sets of observations for North America (US, all 50 states, plus Canada, and Mexico) twice a day, at 00Z and 12Z. This provides all known observations, not just a coarse subset of data. This data differs from our premium Global Surface Archives product in a few ways: the Digital Atmosphere version is in a binary format usable for plotting and analyzing in Digital Atmosphere only, there is no coverage outside North America, there is only data twice a day instead of 24 times a day, and it requires Digital Atmosphere 2018 V3.06 or later. As with other datasets, the coverage is sparse in the 1930s and early 1940s due to the limited availability of hourly observations. However the package offers a spectacular look at synoptic and mesoscale details for almost any situation going back to the WWII years. You can download this data free at our downloads page. What kind of other cool stuff does Digital Atmosphere do? Digital Atmosphere contains a scheduler for automatically retrieving and redisplaying maps every hour (copies can even be saved to disk). There is a fascinating climatology module that lets you display highs, lows, rainfall, etc for specific cities or plotted on your basemaps. Finally Digital Atmosphere is a great tool for creating basemaps that can be used in web sites, studies, and publications. Why not just use premade weather maps I can already get off the Internet? Nearly all Internet sites let you look at only live data. You're out of luck if you want to see the maps that led up to a significant weather event. With Digital Atmosphere you can load and view historical data any time you want! What's the fun of using a map you didn't make? Maps online are often not quite perfect for the uses you intend. With Digital Atmosphere you have total control over the appearance -- you can specify your own contours, plot styles, and overlays. You are totally at the mercy of online map sites. If they go down or stop receiving data (which is common from time to time), the maps also go down. With Digital Atmosphere you are not tied to one specific data source. You always have maps at your fingertips. What's the difference between the Standard and Professional Version? Highly detailed raster basemaps for the United States at 4 different levels. It fills up an entire CD-ROM. No serial and key validation -- our anti-pirating scheme is disabled so you never have to register your copy. Suitable for corporate use. What's this I hear about topographic maps? Topography is an essential element of forecasting weather, and Digital Atmosphere features both topography and photoreal terrain. What kind of system requirements are there? All you need is a Windows computer (Windows 7/Vista/XP/2000) with at least 30 MB of disk space. That's it! Digital Atmosphere is also cleanly written and unlike a lot of software does not populate your system with dozens of nasty drivers, DLLs, and dependencies. 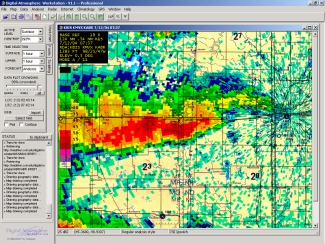 The software was written by Tim Vasquez, a former Air Force forecaster and veteran storm chaser. Digital Atmosphere enjoys a legion of grass-roots support because it is a clever software application written for professionals and amateurs alike. Of course! Our downloadable version is fully functional, and when you register there's nothing else to download or install. Simply scroll to the top of this page and use the DOWNLOAD link at the left. Certain features in your evaluation version will stop working after 30 days. You will still be able to retrieve, import, and create maps, but certain features are disabled. These features are restored when you register the software and you get your key; you simply enter it in Help > Register. Your registration is appreciated; not only does it make your copy legitimate but it goes to pay the author's mortgage and groceries. Rest assured you aren't just feeding some corporate bank account. How can I order? What's the cost? Just go to the top of this page and look at the ADD TO CART links on the left-hand side. The cost is $89 for the Standard Version and $199 for the Professional Version. Check out our contact page to reach us with comments and questions. What other support options are there? For general questions about Digital Atmosphere and other software, visit our online forum. Also read the informative Frequently Asked Questions (FAQ) list. 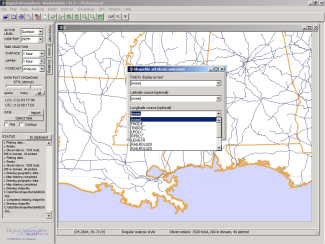 INDUSTRIAL - Perhaps the most popular use for our software is for power companies to research current and past weather data to determine energy loads, as well as to do day-to-day forecasting. UNIVERSITIES - Many instructors have found that Digital Atmosphere makes a powerful tool for recreating examples and case studies: a perfect thing since Internet maps perish in mere hours. GOVERNMENT - Digital Atmosphere has proven itself as a powerful utility for all kinds of forecasting and research work in the government sector. RESEARCH - Digital Atmosphere is used to sift through historical datasets (including the sets we sell) and to examine current weather in closer detail. 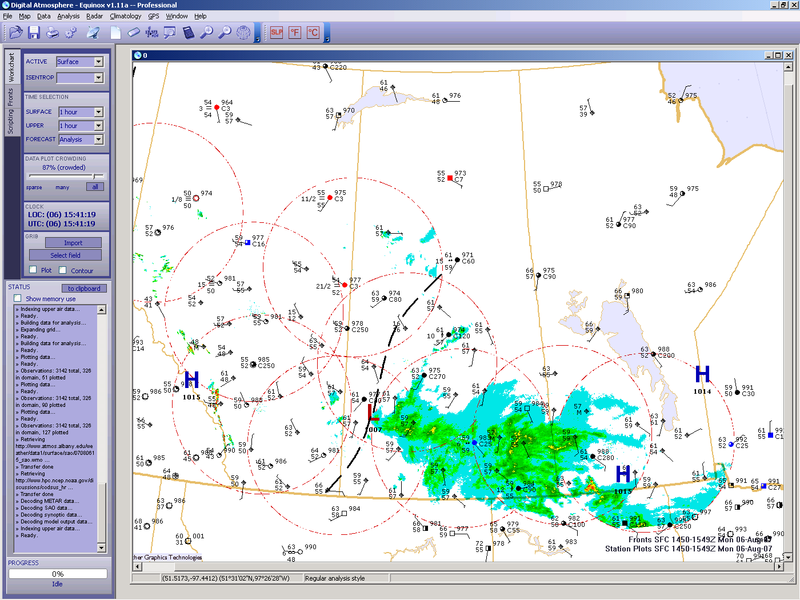 CONTRACTORS - The Digital Atmosphere software package makes a powerful add-on for all types of meteorological equipment. PUBLIC FORECASTING - Private consulting firms find Digital Atmosphere to be an indispensable and flexible tool for all types of situations. MILITARY - Digital Atmosphere's no-nonsense graphics, easy usability, and flexibility compared to corporate display systems makes it ideal for all types of planning and operational decisions. AVIATION - Digital Atmosphere makes it easy to examine winds aloft and examine weather systems three-dimensionally. MARINE - Using ship reports and buoy data, Digital Atmosphere helps fine-tune wind and wave forecasts that are only hinted at by models in data-sparse regions. 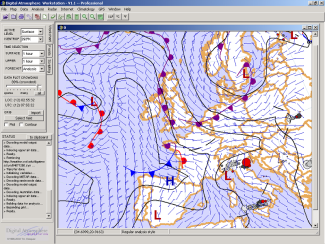 TELEVISION - Digital Atmosphere makes an excellent backup for demanding forecasters, offering an excellent alternative to black-box weather display systems and inflexible, sometimes unreliable Internet graphics. "It was a great pleasure to receive a new key for our very useful Wx Software Digital Atmosphere 2000. I am thankful to you. I am working with your Digital Atmosphere 2000 software here in Bangladesh Air Force." "DA is really a great software, I cannot live without it! When will the next= major upgrade be made available?" "The addition of NEXRAD radar has made this program valuable far beyond its price. Thanks for all the hard work." "I am very impressed with what you have done. I have already shown several people at work your site. I plan on talking to our MIC (Meteorologist In Charge) soon to see if we can get Digital Atmosphere in the office to complement/supplement AWIPS."